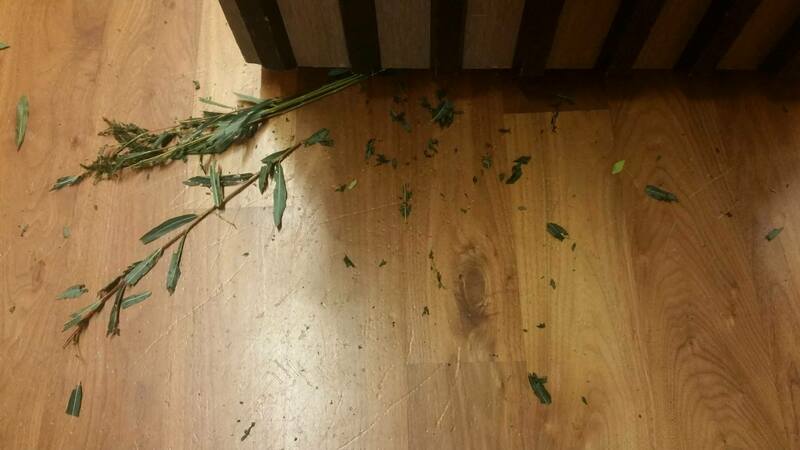 6 outside-the-booth Sukkot events around the Bay – J. As Jewish organizations around the Bay Area get ready to shake the lulav and host communal dinners on Sukkot, a few hope to create innovative experiences that honor the spirit of the holiday — with a twist. Take the Contemporary Jewish Museum in San Francisco. The museum is erecting its first lobby sukkah since its 2008 opening and making it “home” to a roster of six artists — each will spend one day in the Sukkah Studio. By both encouraging visitors to watch the artists make art as well as soliciting help from the public, the CJM is enacting its own version of the holiday’s spirit of welcome, according to Fraidy Aber, director of education and public programs. The artists run the gamut. On Oct. 5, the first day of the weeklong holiday, printmakers Michelle Wilson and Anne Beck will ask participants to help embroider a life-size watermark of a rhinoceros. On Oct. 8, with artist Mary Corey March, people will be invited to write down their thoughts on the subject of “refuge” on hand-dyed, natural paper. Ending the project on Oct. 10, painter Jon Levy-Warren will sketch visitors’ portraits on clear vellum laid over Plexiglas, drawing museum visitors into the art piece itself. The museum’s sukkah will be a lattice of reclaimed wood that, by the end of each day, will be festooned with art. But, with impermanence in mind, the art will come down every evening so that each artist will begin afresh. “Every day it’ll look different,” Aber said. “Sukkah Studio” from 11 a.m.-5 p.m. Oct. 5-10 in the CJM lobby, 736 Mission St., S.F. Free. There are urban farms, and then there are farms. Eatwell Farm, in Dixon, is one of the best-known organic farms in California. It’s also the place Berkeley-based Wilderness Torah will be holding its longstanding, four-day, three-night Sukkot on the Farm. It’s a tradition for Wilderness Torah, which advocates “earth-based Judaism” and a Jewish connection to nature. The first festival was 11 years ago. “It’s a beautiful mix of people returning and people coming to explore,” said Wilderness Torah founder Zelig Golden. 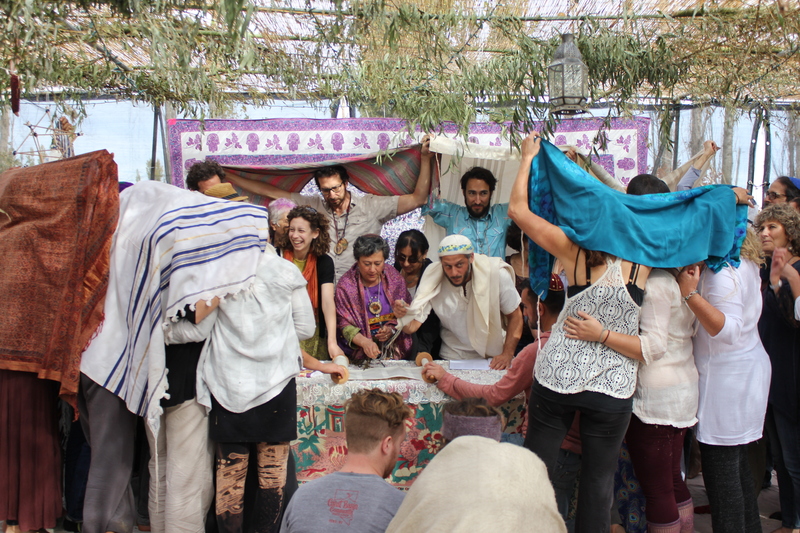 The celebration is about taking Sukkot literally into the fields by creating a village of tents, then honoring the holiday with organic food, learning, bonfires, music and meditation. Many years, such as this one, Shabbat also is observed. “People get reconnected to Judaism, reconnected to the Earth and to community,” Golden said. But also it’s about fun, such as BOLO providing live music. “Two hundred and fifty people dancing their tushies off into the night,” Golden said. “Sukkot on the Farm,” Oct. 6-8, with an optional evening ticket for Oct. 5. $395, with sliding scale available. The JCC of San Francisco is taking the harvest theme of Sukkot more traditionally, but going “out of the box” with location — literally. It’s leaving its building and hosting a sukkah at the Saturday Ferry Plaza Farmers Market. It’s part of the JCC Pop-Ups program, which aims to get the JCC into the community. “This is a way to bridge Jewish life and daily life,” said Gayle Effron, special projects producer at the JCCSF. On Oct. 7, the farmers market sukkah will host activities from the usual (“introduction to Sukkot traditions”) to the more unusual (food demos, grower talks, candlemaking and a scavenger hunt). Attendees will also be invited to put together hygiene kits for the homeless, with things like socks, soap and toothbrushes. Also, the Paul Dresher Ensemble will be on hand with its Sound Maze, an installation that uses invented instruments to let adults and children experiment with making music. “We wanted to look at a variety that reaches different age ranges, but also different interests,” Effron said. In addition to the market pop-up, which will be run in conjunction with CUESA, the nonprofit that oversees the Ferry Plaza Farmers Market, the JCC also will have a sukkah of its own at its facility and will host Shabbat dinner on Oct. 6. But Sukkot at the JCC is a tradition, while the pop-up is breaking new ground. “We really wanted to flip that model and bring a sukkah out into the community,” Effron concluded. JCC of San Francisco pop-up sukkah, Ferry Plaza Farmers Market, 10 a.m.-2 p.m. Oct. 7 at the Ferry Building at the Embarcadero, S.F. The JCC of the East Bay’s take on Sukkot also will be bringing art into the sukkah itself. In fact, it is bringing a production of Shakespeare — sort of. “It’s an interpretation of ‘King Lear,’ but it’s with two women,” explained Amy Tobin, the JCC’s CEO. Because a sukkah is temporary, Tobin said, it lends itself to talking about impermanence — even the impermanence of life. 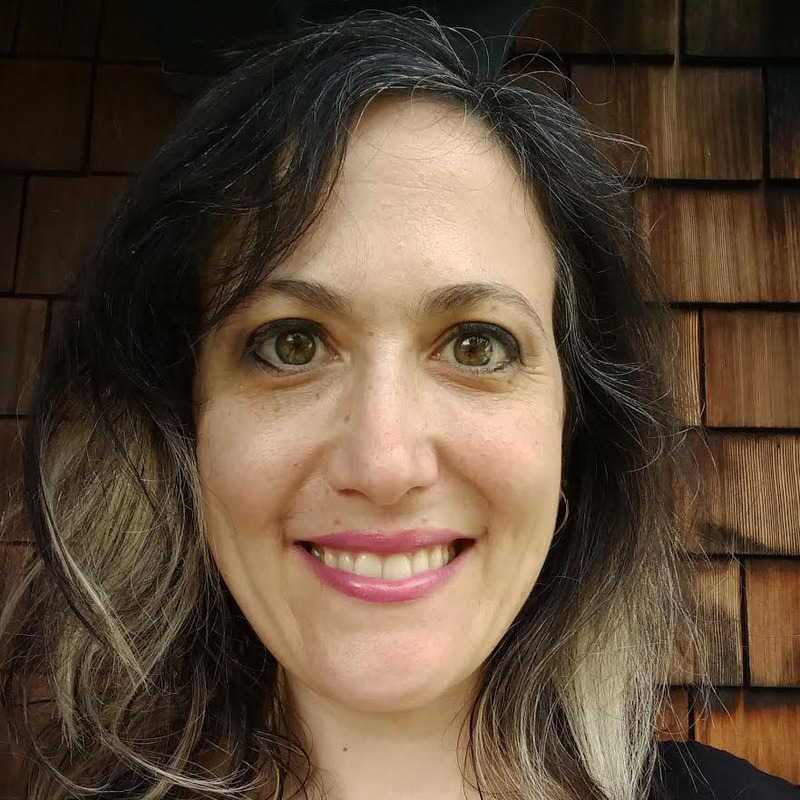 The play will be followed by an audience conversation about death and dying facilitated by Shoshana Berger, editorial director at design company Ideo, who has written and spoken extensively on breaking the taboos about talking about death. 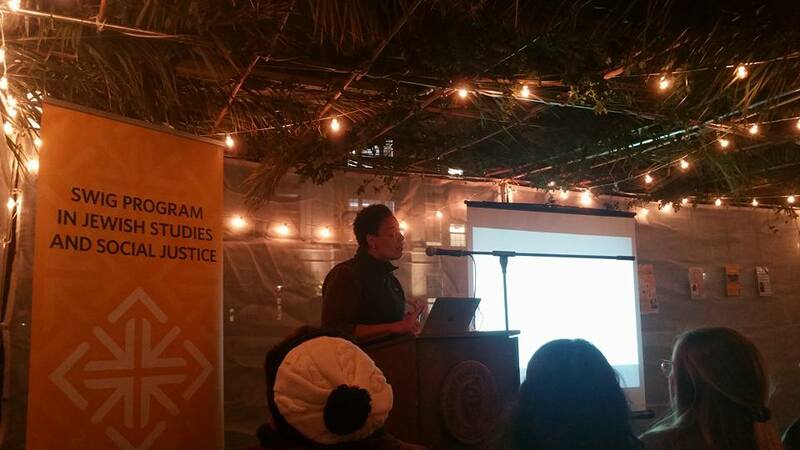 “What better place than a sukkah to do that,” Tobin said. “Mother Lear,” 5 p.m. Oct. 8 in the sukkah at JCC East Bay, 1414 Walnut St., Berkeley. $25-$35. Across the bay, Urban Adamah in Berkeley is taking the commandment of living, or settling, in the sukkah seriously. “What better way to play ‘Settlers’ than to do it in our sukkah?” said Adam Berman, Urban Adamah’s executive director. By “Settlers,” he was referring to Settlers of Catan, a multiplayer board game with a huge following; it’s popular for being simple to learn but with deep, layered strategies. Urban Adamah’s “Settle in the Sukkah” is an 81-person tournament open to all ages and skill levels. The winner will get fresh vegetables and honey from Urban Adamah’s farm. But don’t let the grand prize make you think the competition will be cut-throat. The idea for the Oct. 7 event came out of Urban Adamah’s mission to meet people where they are and give them opportunities to do what they love. In spite of the apparent oddness of the combination, once it was thought of, it was, as Berman said, “a no-brainer.” Berman, himself a Settlers player, will be there. “It’s been on my calendar for six months,” he said. “Settle in the Sukkah” Settlers of Catan tournament, 7 p.m. to midnight Oct. 7, 1151 Sixth St., Berkeley. $10. Limited-seating event. If games aren’t your thing, Urban Adamah is serving up another version of Sukkot on Oct. 9 — an adult version. The Jewish educational farm will be asking guests not only to shake a lulav, but shake their body, and maybe a cocktail, too. “It’s been super popular and people seem to want to come back,” said Berman of the event, officially titled “Party in the Sukkah: Adults Only” and now in its fifth year. The evening event will start with a kosher wine-tasting at Covenant Winery, across the street from Urban Adamah. 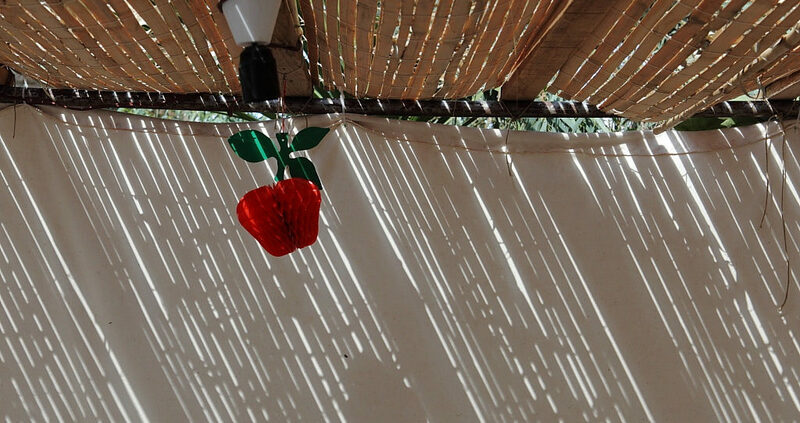 Then, artists from the Jewish Studio Project will run a workshop that explores creativity through the themes of Sukkot. The evening will end with a dessert potluck, a Sukkot ritual and dancing to the live music of BOLO, a trio that combines African-sourced grooves with sacred folk songs from around the world. “Party in the Sukkah: Adults Only,” 6 to 9 p.m. Oct. 9, 1151 Sixth St., Berkeley. $5-$10.